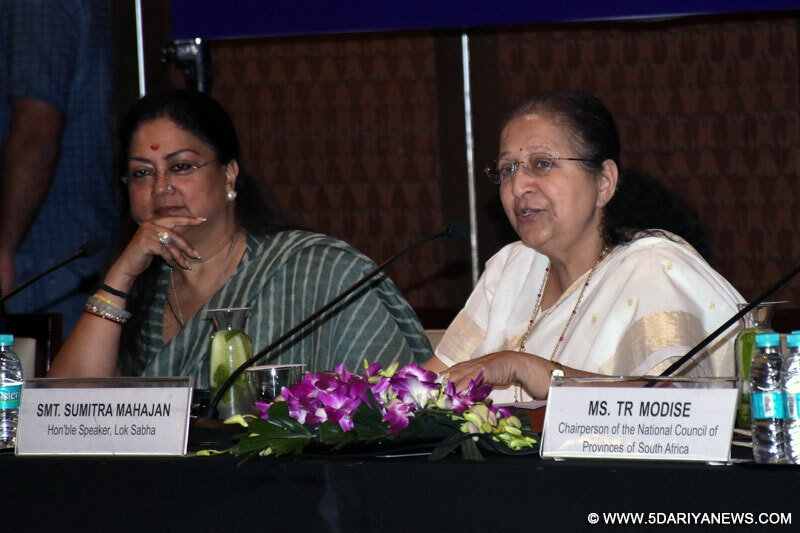 The best way to predict future is to create it, Lok Sabha Speaker Sumitra Mahajan observed on Sunday while addressing the First Meeting of BRICS Women Parliamentarians' Forum here.The two-day event was inaugurated by Mahajan at Rajasthan Vidhan Sabha Chamber on Saturday.The meeting ended with the adoption of the Jaipur Declaration, which calls for 'equity', 'inclusivity' and 'sustainability' to be factored into all development plans and asks to institutionalize the BRICS Women Parliamentarians' Forum as an annual affair.Addressing the delegates at the valedictory function, Mahajan said that dialogue among parliamentarians is important to achieve Sustainable Development Goals (SDGs) and exhorted them to learn and benefit from the best practices in BRICS countries. She hoped the event would encourage women parliamentarians to meet regularly to discuss issues and exchange views in order to acquire deeper insight and develop a perspective on the problems and challenges faced by them as lawmakers. The meeting deliberated upon three topics: ‘Perspectives on implementation of SDGs', 'Role of Women Parliamentarians in involving citizens' and 'Containing climate change: Imperatives of global cooperation'. Delivering the valedictory address, Rajasthan Chief Minister Vasundhara Raje said that women lawmakers who are also daughters, mothers and sisters, not only represent people and guide administration but also bring to the table compassion and caring. This makes them more able guardians of processes that lead to improving the quality of life of our citizens. The Jaipur Declaration expresses commitment to intensify mutual cooperation based on the framework and associated action plan agreed upon and reaffirmed at the First BRICS Parliamentary Forum held in Moscow in 2015.It exhorts international financial institutions to “support and facilitate financing for development on favourable terms” for the developing and the least developed countries, and to help them gain easier access to new and affordable technologies for capacity-building.It also underscores the need to address climate change “in all its manifestations”, and work out “integrated solutions” to preserve and protect ecological systems and forests and ensure food security.